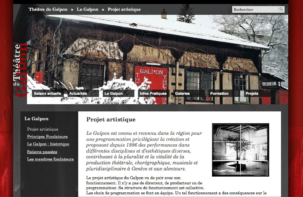 A new website of Théâtre du Galpon, built with the SPIP Content Management System. • The header photos can be either randomized, or “fixed” for a specific category, and can be easily changed by the site editors. • A keyword-system allows to freely select the articles featured on the frontpage (they can be in any category). • The amazing SPIP plugin “Les Crayons” allows the editors to modify text directly on the page, without going through the admin interface. 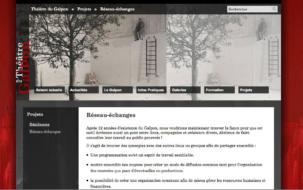 • The SPIP plugin “Agenda 2.0” allows to manage dates of plays in a convenient way. 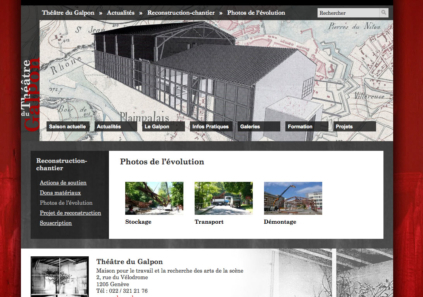 Founded in 1996 in Geneva, le théâtre du Galpon was located for 12 years in a building at Artamis, a former industrial site that became a cultural area in 1996. It has provided rehearsal space for several companies, and hosted numerous plays, dance and music performances. Since the Artamis site is currently being depolluted and transformed into a housing area, the Theatre has to move. 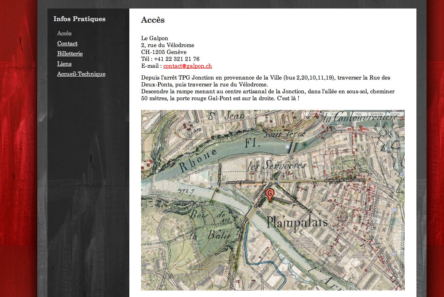 The building has already been dismantled and moved to a new site, near the Rhône river. The Galpon crew is looking towards the reconstruction in the forthcoming months.